When Aedes de Venustas sent me a sample of their new Copal Azur fragrance, I immediately sent it to Kevin. Kevin (who some of you old-timers might remember used to review home fragrance here, including lots of incense) was not impressed. It did not, he said, smell like real copal. I wouldn't know from real copal; my experience is pretty much limited to Demeter Incense, which is advertised as having "a unique core of Copal". Send it back, I said, I think it smells great. I include that story only to warn you that while it does, to me, smell great, Copal Azur might or might not meet any expectations you might have about a copal fragrance — remember our recent discussion of "realism" vis-à-vis the gardenia in Tauer Perfumes Sotto La Luna Gardenia?1 If you love incense in general, though, or if you've been a fan of the three Aedes fragrances that preceded this one (Oeillet Bengale, Iris Nazarena and Aedes de Venustas Signature), do give Copal Azur a try. Karl Bradl was drawn to its scent while cycling on the coast of the Yucatán Peninsula through copal-laced air towards the natural reserve of Sian Ka’an, which translates as “Gate to Heaven”. The suave cloud of burning copal whirling over Tulum's bohemian and eco-chic outdoor locales at the foot of an ancient Maya walled city, confirmed his inspiration for Copal Azur. The ruins of Tulum sit on a cliff above the beach. It's a gorgeous spot, if somewhat overrun by tourists, and the notes for Copal Azur reflect the location (minus the spring break cocktails and suntan oil): ozonic and salty notes (the ozonic part being the source of my worry), plus cardamom, patchouli, amber, frankincense, myrrh and tonka bean. Anyway, I needn't have worried. Copal Azur is airy, yes, and the salty notes lend a pleasant seawater-y undertone to the blast of frankincense which dominates the opening. I don't notice the ozonic notes in particular, or else the combination of ozone and frankincense reads more to me like a crisp stone / mineral effect. There's also a thread of dark green woven through the early stages; as it dries down, the scent slowly sweetens and becomes warmer, more spicy-ambery. The final stages are softer and creamier, with a touch of vanilla and a velvety finish smoothing over the resinous notes. Copal Azur is a lot of incense — if you don't like incense, I should think you can safely skip it altogether. Still, it's not churchy or brooding. I classified it immediately as an outdoor incense, a category in which I also include Comme des Garçons Ouarzazate, Sonoma Scent Studio Incense Pure and Tauer Incense Extrême, but that's really only accurate for the first half of its development. Later, it's more of an incense comfort scent (anyone remember Juozas Statkevicius Eau de Parfum?) and while I would call Copal Azur season-less, I have found it a particularly nice corrective for cold gray weather. Copal Azur is unisex, and the lasting power is excellent. Verdict: I love Copal Azur. It's my favorite of what Aedes has done so far, and I've liked them all. It went right on my buy list, but for me the price and size of the full bottle (the packaging is admittedly gorgeous) is a major disincentive. If I'm smart, I'll never buy 100 ml of anything ever again. What we really need is a coffret with travel sizes of all four, or alternatively, to be allowed to mix and match the purse spray refill sets. I'd buy one right away. 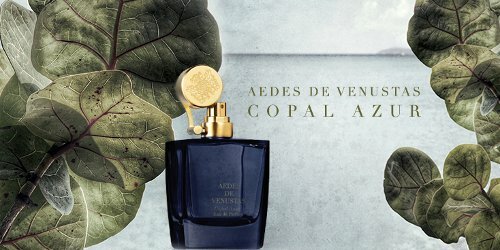 Aedes de Venustas Copal Azur is available in 100 ml Eau de Parfum ($245) or in a purse spray with three 10 ml refills ($195, or $110 for just the refills). For buying information, see the listing for Aedes de Venustas under Perfume Houses. 1. And I'll also add that the press materials for Copal Azur say specifically that there is no copal in the materials: "Since copal resin cannot be used as a perfume ingredient, three different extractions of frankincense are used to conjure it from top to base notes, making up an extravagant 30% of the formula." 2. Just to clarify, we don't take direct advertising from perfume brands for precisely this reason — I'd rather not be in the position of reviewing products made by our advertisers. Since some retailers have started introducing their own branded perfumes, and since I also don't want to ignore great fragrances, which are after all few and far between, here we are. But I will readily admit that if I didn't think Iris Nazarena Oeillet Bengale Copal Azur was wonderful, I probably wouldn't review it at all, so in that sense, I think you can say that this isn't a totally objective review, if such a thing indeed exists. What percentage of perfumers’ trips that supposedly inspire fragrances do you imagine actually take place? That said, it did not in any way bring up the Yucatan for me, but not sure what would. I was there 2 weeks, all over the interior and coast and up to Merida, and pretty darned sure I never smelled copal anywhere. Thank you, Robin, for the detailed review; I’ve been waiting to hear about this one! I am mad about the first in this newer Aedes series (the eponymous Aedes), quite fond of the second (Iris Nazerena), and sadly disappointed by the third (Oeillet Bengale, which started brilliantly but turned quite sour on my skin, as most rose-centric scents do); Copal Azur is definitely at the top of my To Sample list. I am not previously familiar with copal, but was excited to see the other notes, most of which are winners for me. You have allayed my one concern – the ozone note – and I am hoping to try it soon. The bottle is particularly gorgeous in blue; however, I *love* your suggestion for the travel-size coffret…Aedes, are you listening? For my AdV favorite, I’ll take Iris Nazarena in Copal Azur’s bottle. Thank you! (BTW: the ozone note in Copal Azur ruined it for me; I did find that note/vibe powerful.) R: I’ll send you some copal to burn. It occurs to me that you’ve sent me all sort of wonderful stuff to burn, and it’s possible you’ve sent me copal and I just don’t remember. Ooooh colored glass travel sprays..drool. lol. As if, haha. I sniffed this in-store and I was very impressed… although it’s not as “me” as Oeillet Bengale (wishlist!). And that blue bottle… divine! +1 Oeillet wishlist and that blue bottle…insert Alisha Keys…”Deeeevine..Deeevine!”. Lol, from that Dahlia Divin ad. Hah, yes!! We need to get together an Oeillet travel-set split during the next splitmeet… the reddish bottle isn’t too shabby, either! Yep, totally:). Was bummed I missed the last split. Honestly I love all the bottle colors they’ve used. And those bottles would look even more divine in 30 ml, LOL…or even 15. Thanks for the review. It’s ok for you to love Aedes even though they advertise here:). Who wouldn’t love their scents, really? Definitely, +1 on smaller sizes that are less than 100 mls. I won’t buy a perfume generally in that big of size. And +1 on a travel spray/purse spray of all four scents/mix and match, would totally go on the Christmas list! Indeed! Haven’t tried Copal but have tried the other three-all great scents. While I am not a huge fan of incense, I’d still like to sniff this one anyway. One of my fave niche lines, if not my fave atm. Just don’t sell to Estee Lauder! lol:). hahaha! I’m with you on that one, Omega! Le Labo and Frederic Malle in a space of two weeks. We can only pray that they leave the brands alone and let them carry on…. I would think they’re buying Malle and Le Labo precisely because they’re different than Aerin / EL. I am not so worried for the short term. Short term, not concerned either..long term has me thinking some. But most, if not all fumes change over time to an extent..due to restrictions/aging/discos/reforms or whatnot. A bummer fact I suppose. I’m glad to see you review this one, since I haven’t seen many people talk about it. As soon as I heard about it though, it went on my must-try list, and I was finally able to get a sample last week. I thought this was great! Demeter Incense was my only concept of copal, too, so I was relieved Copal Azur wasn’t that sweet. I did get a tiny hint of the ozone, but I thought the watery element worked really well. Plus, the lasting power was great on me. It’s definitely a shame it’s so pricey. Oh good, glad someone else did not find the ozone overpowering, and of course glad someone else thinks it’s great! Yes, the Demeter is nearly a gourmand comfort scent, and while it’s nowhere near as nice as the Aedes, it’s also incredibly cheap and I do like it so will put in a nice word. I love all the Aedes scents. I even think the iris one is okay and I am so not an iris person. I’ve been to Tulum and can honestly say I didn’t smell anything like incense anywhere. I did smell this at Aedes and remember liking it. I just got my sample the other day but haven’t really tried it yet. I think this is a great take on incense. It’s not churchy and that salty note really adds something different. I like salty notes though. My skin didn’t amp up the ozone in this so that didn’t bother me too much. Sometimes ozone notes smell too much like air fresheners on me instead of perfume. Hmmm, I was looking forward to trying something that maybe smelled like copal but I’m not surprised it doesn’t appear to. Ozonic and sweet are certainly not what I experience from copal, but it does sound like it might really be my thing anyway. I love a good incense fragrance. Interesting! I am surrounded by small Mexican groceries, I will have to see if I can find any. Lots of times they’re in little packets with the spices and/or traditional medicines – which is always a fun section to peruse anyway. Thanks! And just saw your comment on the SOTD, hope you feel better soon. Huffing diesel exhaust? You were an interesting little kid! The word you’re looking for is weird, but I come by it honestly and have learned to embrace it. Robin, you only mentioned patchouli once, and that was to list is a note. So, I’m hoping that means that the patch is not very prominent? It is not very prominent to me at all. But also, I used to dislike patch, and now that it’s 99% of the time a clean fraction of patch, it doesn’t really bother me at all. The patchouli isn’t prominent on me either. I really was not fond of the Aedes Iris or Oeillet, sadly/happily. But I looooved Signature and own it, and had high hopes for this one. Sounds like I’ll have to get a sample anyway, since it’s Duchaufour again, and it’s your favourite from the brand. I am jealous of your Une Rose but even more jealous of your trip in January. Why do they say “copal resin cannot be used as an ingredient in perfume”? Some houses, notably Strange Invisible Perfumes, list it in notes for several of their liquid scents, so it must be technically possible to distil, it just may be easier to do it in-house. They make it sound as if the form was an issue, but frankincense is a resin, too. I noticed that SIP listed it as a note in a couple perfumes when I did a search while writing this. I have no idea, but wondered if it was like gardenia, which can in fact be extracted on a very small scale (Enfleurage sells it from time to time) but for all intents and purposes really cannot be used as an ingredient. But just wondering, I really don’t know. I love Copal Azur and already want to buy a backup bottle! LOL. I am an incense fiend and fell in love with this on first sniff. It is not ozonic on me at all, just warm incense. My favorite release of 2014! Well, as it lays, Robin, we all know Kevin is Notoriously Difficult to please, so I do think that I’d follow your opinion on this scent more so… just from an offhand basis. And I am one of those people that LURVE Big bottles… I use fragrance so lavishly, that I do run through a fragrance I like quickly and need to restrain myself. I actually am in the camp that feels companies need to make BIGGER Bottles! I hate incense, but I tried Copal Azur (I don’t know why) and I love it. All perfumes from this house look nice for me, but this one is something strange and unexpected. It’s first incense aroma I want to buy and wear.